This S-Class based sedan is the flagship from Daimler-Benz. 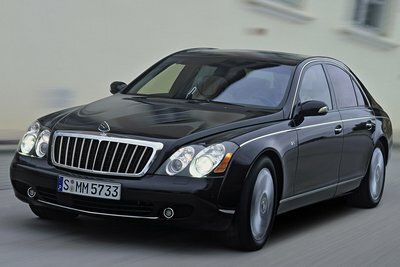 The Maybach 57 is named for its 5.7 meter length, and is a sportier alternative to the longer Maybach 62. A new 57S model has better handling than the standard Maybach 57, and a more powerful 604-bhp 6.0L twin turbo V-12. Acceleration from 0-60 mph occurs in 5.0 seconds, with a top speed of 172 mph. The standard engine is a 5.5L twin turbo V-12 with 543-bhp, which is also shared with the Maybach 62. Both engines are mated to a 5-speed automatic. A standard Airmatic DC air suspension provides a smooth, level ride. Bose� supplies a 21-speaker audio system that is linked to dual rear LCD TV/DVD displays. Maybach sedans are marketed as luxurious mobile offices for their owners, and offer internet access, and other business-oriented options.